FarmVille English Countryside: A Sheep of every color; plus, meet Duke! With the upcoming release of the FarmVille English Countryside, more information keeps flowing from all directions, with two new updates coming to us from the official FarmVille English Countryside Facebook fan page. The first shows us a closer look at the upcoming Sheep Pen, and the many, many different patterns and color combinations of sheep we'll be able to create. As we can see from the image above, we can see not only the plain, new colors of sheep (like a yellow and dark red sheep), but we can also view ones with polka dots, a camouflage pattern, a stripe down the belly, and even stars! There are little details known about how we'll actually go about creating sheep with these different patterns or in particular colors that we'd like, but we're getting more excited about this new feature by the second. 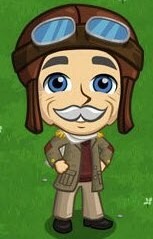 Next, it looks as though we've finally met the man that will take us to the English Countryside once it launches, as Zynga has introduced us to a man named Duke, a pilot that has come out in search of a new farmer for village that "has no farmer." Of course, we'll be able to take on the job at some point, and apparently, Duke will be the man to fly us to our second home. With more details being released on what seems to be a daily basis, we can only imagine that the English Countryside expansion is nearly (finally) upon us. Make sure to keep checking back with us, as we'll bring you continued coverage of this game-changing event, and we'll make sure you're the first to know when we can finally make the journey overseas. Which of these patterns / colors of sheep are the best? 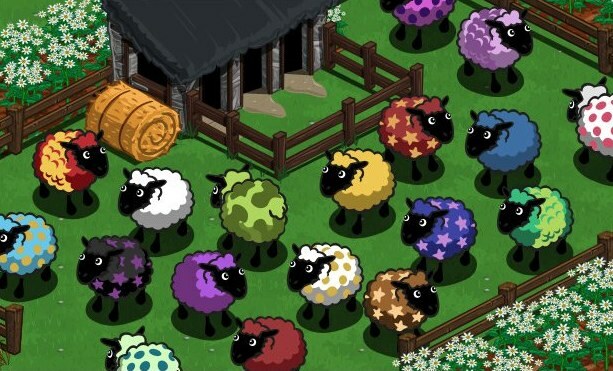 Will you try to create every single combination of sheep available, or will you stick with a specific color theme? Let us know in the comments.